On Monday I went to Kensington Market for my every three-month trip to the dentist, and took the opportunity to visit my favourite butcher in the city, Sanagan’s, as well as my favourite cook book store, Good Egg. Specifically I was on the hunt for a good bread book. I’ve been working with my sourdough starter about once a week. I’d like to be baking more frequently, but in following Peter Reinhart’s instructions, I find the process incredibly complicated and even with my Virgo brain, scheduling in the process for making one of his simple loaves of bread has been a real challenge in my 9 to 5 life. So far as the quality of the bread itself goes, I’ve progressed to achieving dependably airy loaves, with lots of (sometimes giant) holes, but so far, the flavour leaves a lot to be desired. 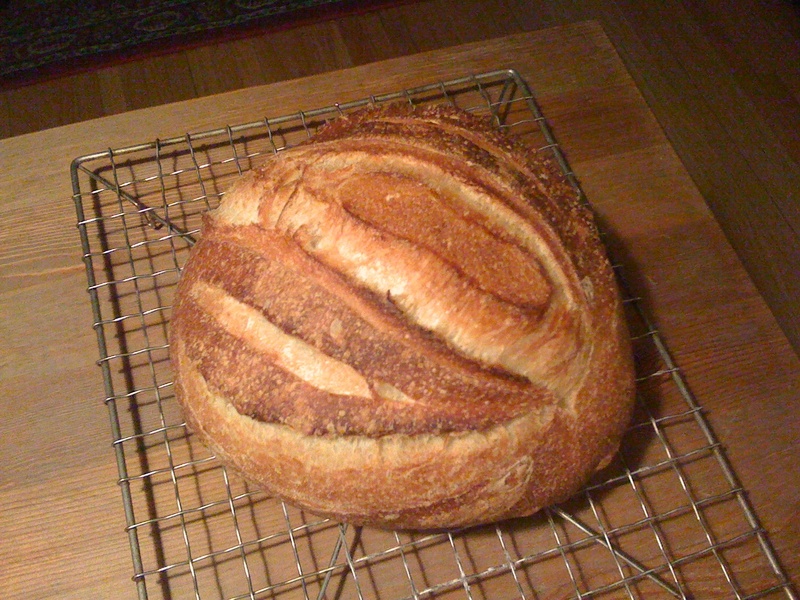 Until I picked up Tartine Bread by Chad Robertson, I haven’t been able to understand why my sourdough just isn’t sour. The answer it seems, is in the bulk fermentation. Following Reinhart’s model, I’m pretty certain this is where I’m going wrong. His bulk fermentation is not long enough, at least not for me, and his books don’t offer a lot of help in troubleshooting or adjusting your timing and process according to variables like humidity, temperature, etc. Everything I know about bread goes against the rigidity of Reinhart’s directions. Robertson embraces experimentation and adjustment as a core principle of perfecting one’s bread. Only two days into reading Tartine Bread, I’m totally re-inspired to keep pursuing my version of a satisfying loaf. Robertson has taken decades of refinement of his own bread recipe at his hugely popular bakery, and condensed it into ratios and techniques that will work for the home baker. He explains ingredients as percentages (and weights) and makes it really easy for the average baker to understand. One of Robertson’s techniques that differs entirely from Reinhart’s is the use of a dutch oven to get the right texture both of the crumb and the crust. He explains that because a conventional home oven is designed to allow moisture to vent, it is impossible to obtain the characteristics of bakery bread without a better way to trap steam, which a dutch oven does perfectly. I have two rounds of dough in the fridge right now (from Reinhart’s recipes) that I plan to bake this way. I’m really excited to see how they’ll come out, even though they haven’t been made with Robertson’s recipe. I also intend to convert my starter to Robertson’s proportions and method — the version I’ve been following by Reinhart makes a ridiculously large amount, and I just can’t bear to be throwing so much (expensive) flour away with each feeding. So here’s to a whole new world of bread. My co-workers have already offered to be test subjects! Doesn’t that look YUM? It’s far more appealing than any past loafs. In fact the last couple have been so underwhelming that I couldn’t even bare taking photos of them. I can’t wait until this cools enough to crack into it. Speaking of cracking… it’s cracking as it cools. Robertson calls this the song of bread. Isn’t that so poetic?